I found lots of interesting facts about turkey vultures on an Audubon site! Enjoy! A turkey vulture can smell carrion from over a mile away! They have the largest olfactory (smelling) system of all birds. 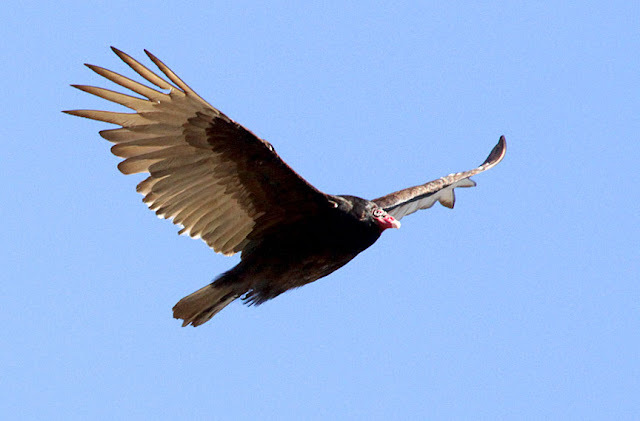 They are also the only scavenger bird that can't kill it's prey. But, they do have an amazing beak that can tear through even the toughest hide. 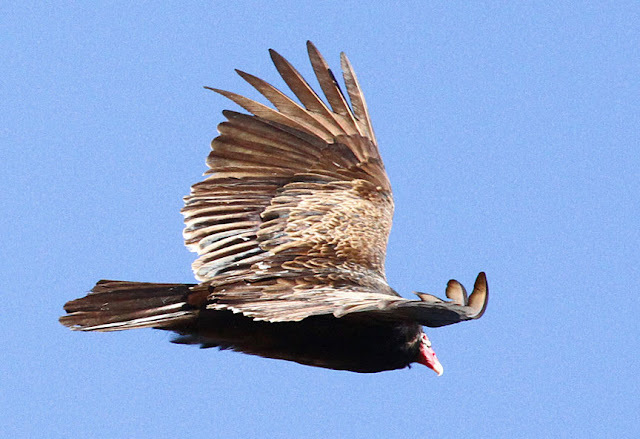 Vultures prefer meat as fresh as possible and won't eat extremely rotted carcasses. They can smell carrion less than 12-24 hours old. During the hot summer months turkey vultures will defecate on their feet to cool them off. 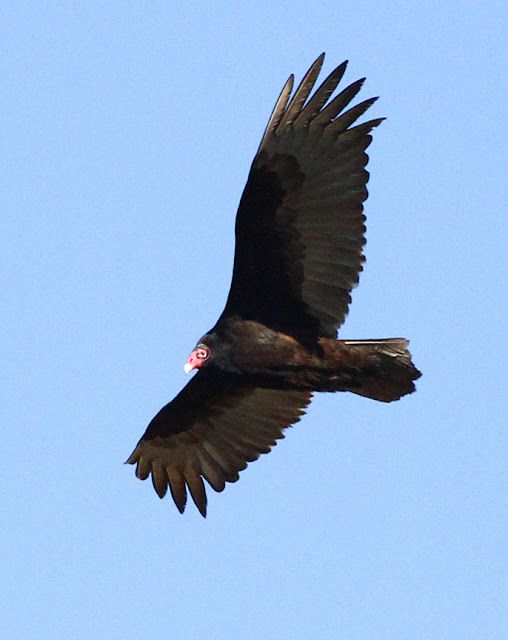 If a turkey vulture is disturbed or harassed, it will throw up on whoever is bothering it. Even the vulture babies will do this! I guess that just goes with the territory! 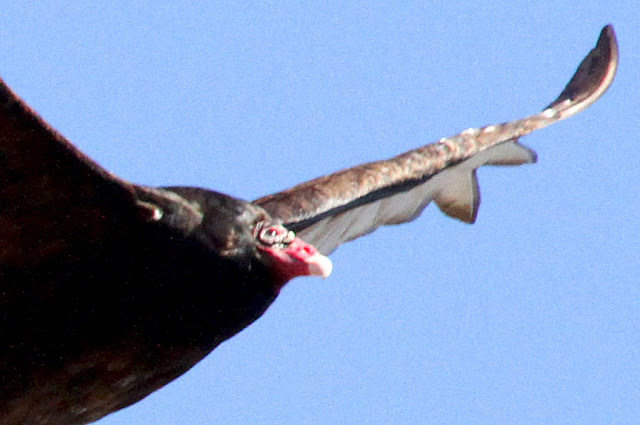 Turkey vultures can swoop up to 60 mph in order to avoid being "mobbed" by ravens or jays. They also have excellent eyesight and can spot dying or recently dead animals from high in the air. 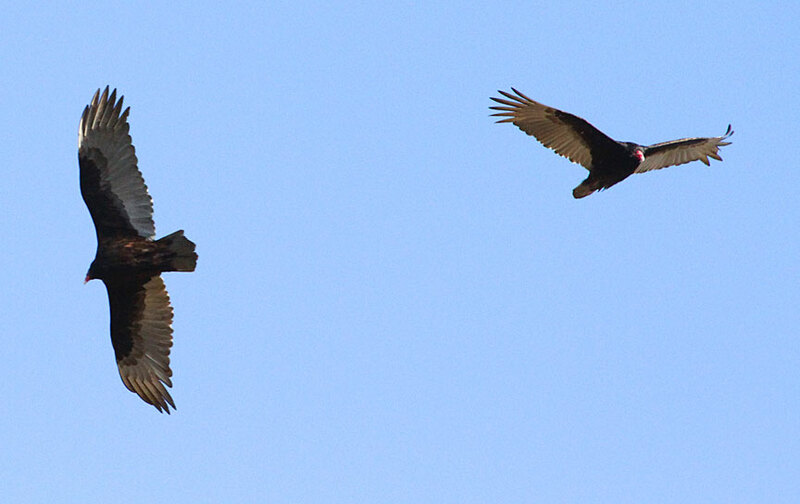 There's a couple ways to identify a turkey vulture when in flight. From a distance, it looks like a big bird without a head. They also teeter side to side while soaring because of their light weight. 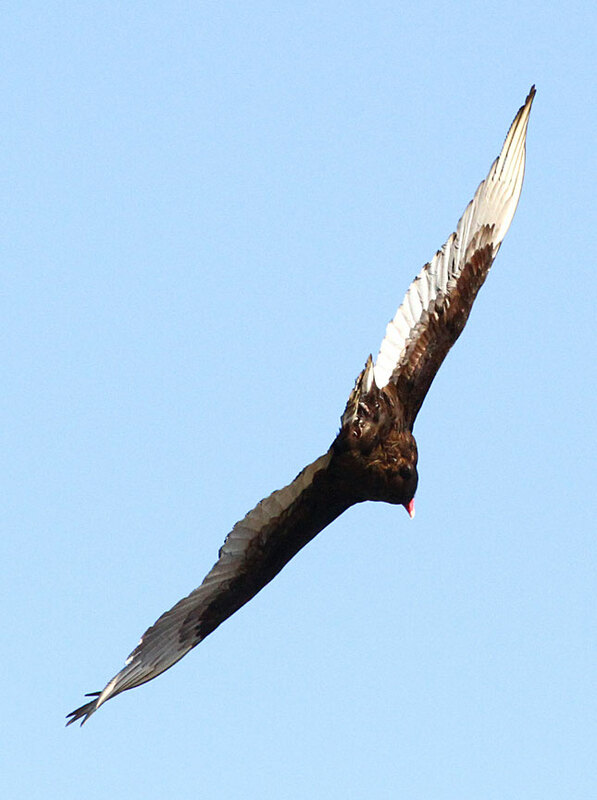 With a wing span of over 5 feet, you'd think this bird would weigh more than just 2 to 4 pounds. Because of their light weight, turkey vultures can virtually float in the sky using the thermal currents (rising columns of air) to get around the skies. 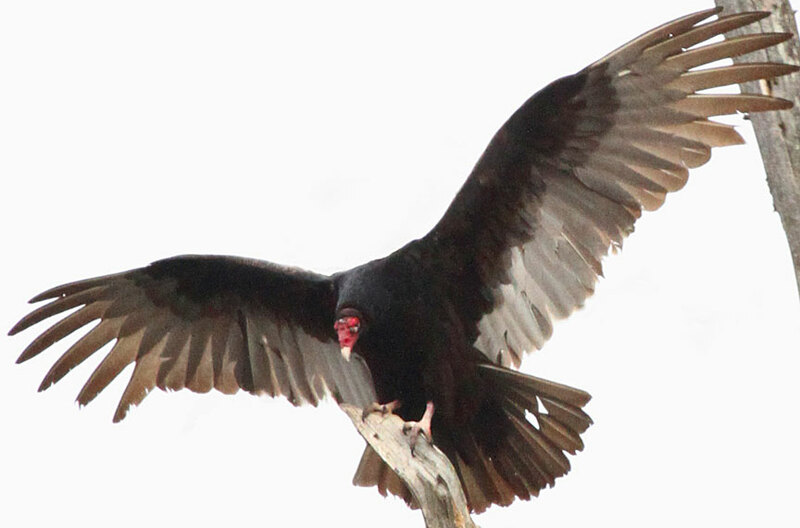 This technique uses very little energy as the vultures rarely need to flap their wings. 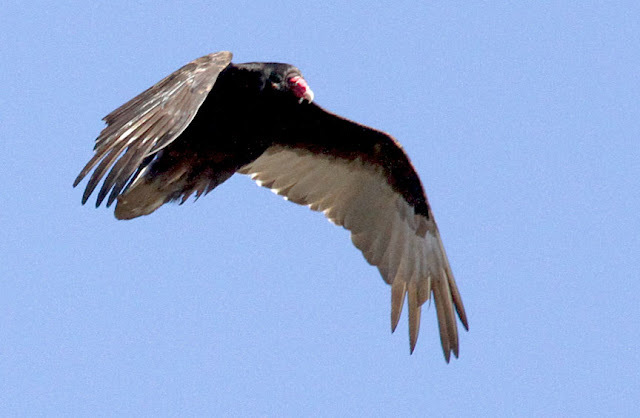 Turkey vultures do not actually build a nest. They are known to nest in very remote, hard to reach locations. Just as well, you wouldn't want to come across a nest only to get vomited on! In the early morning hours you may see turkey vultures sunbathing in a tree with their wings spread out in a horaltic pose. This is most likely done to increase their body temperature after the cool night. And here's the last interesting fact, even better than the vomit one. 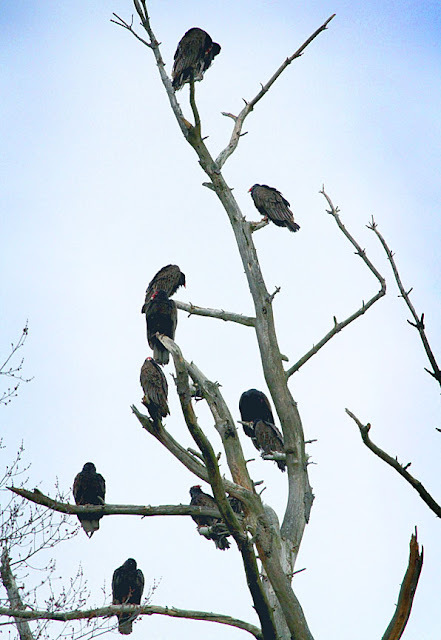 Groups of perched vultures are called a wake. Seems obvious, doesn't it! Great photographs! 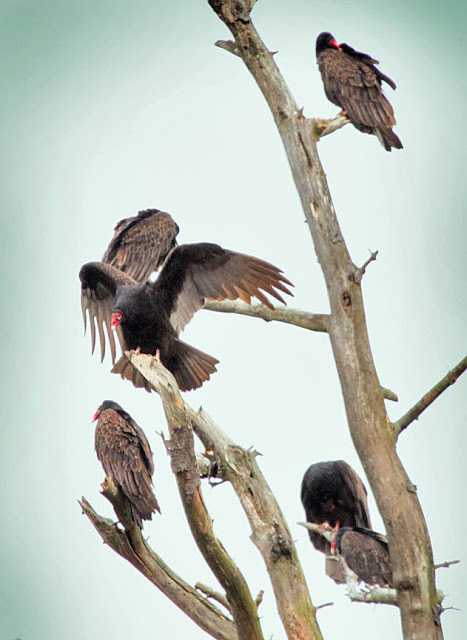 I love the last one, I've never seen so many Turkey Vultures in one spot before!